You will be asked to supply contact details upon reservation, as well as the size of your group. A non-refundable R500 deposit per person will be charged at registration for both tandem students and First Time Jump (FTJ) students. Please also note that skydiving is a weather dependant activity so your reservation may have to be rescheduled accordingly. The club operates on weekends and public holidays throughout the year, except Christmas and New Year, and during the week on special request subject to a minimum number of bookings. Skydive Robertson is a club more than it is a business, so doesn’t operate during the week as unfortunately we all have to work to jump. If you want to book something other than the First Time Jump (FTJ) course or a tandem skydive, then all you need to do it turn up when the dropzone is open with your log book and chat to the duty instructor or jumpmaster. 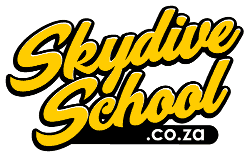 To send us a message, either send an email to info@skydive.co.za or use our contact form. If you want a give your loved one, best friend, nemesis or even your mother-in-law, something special then why not consider giving them a tandem skydive or a spot on our First Time Jump (FTJ) course? If so, we can design a gift certificate for you to give them on request. Somebody will still have to pay for the option you choose, but we’re happy create a gift certificate for you to use. Use the booking form below to make your booking. Once you’ve submitted your booking request we’ll be on contact to arrange a date and ensure you meet all of the requirements. You can make payment for your course using the banking details below. Please make any electronic payments to the following account, and e-mail a copy of the proof-of-payment to bookings@skydive.co.za. BOOK A PLACE ON OUR FIRST JUMP COURSE!